Maxwell House Lite Ground Coffee with Half the Caffeine - This deliciously rich, medium roast coffee has just half the caffeine of our regular coffee. It's a quality blend of 100% pure regular and decaffeinated ground coffees. It may be light on caffeine but it's certainly big on flavor. 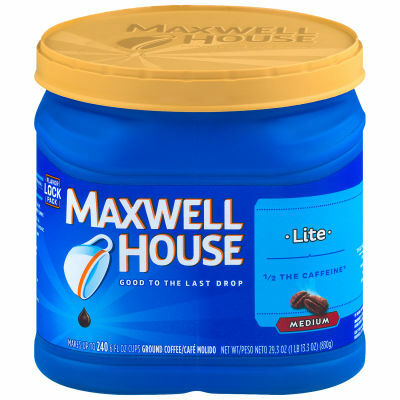 Half Caff Coffee that's Enticing, Not Bitter - For those who enjoy drinking coffee, but want to limit their caffeine intake, Maxwell House Lite is the perfect choice. This medium roast is Good to the Last Drop and a great way to start your morning.